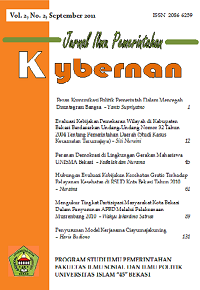 This study explores the relationship between Policy Evaluation Guide to Health Services in Bekasi Hospital in 2010. Theory used in this study is, the concept of public policy evaluation. Methodology used is correlation, also stressed on the type of case studies will be presented in the form of analysis in the discussion. The findings in this study is, Jamkesda policy has responded positively and enthusiastically by the poor and underprivileged in the city of Jakarta, but in terms of services remains to be done to improve and / or significant improvement.